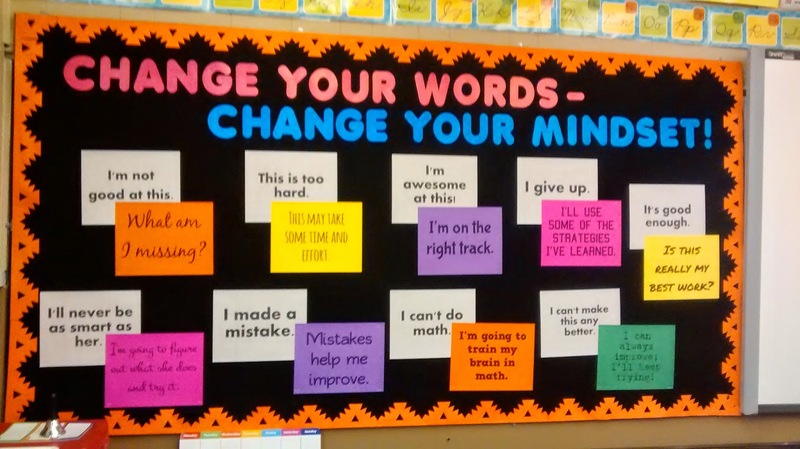 At the beginning of this school year, I set up some growth mindset self-talk phrases on my bulletin board. I had seen many great examples of elementary boards that encourage students down this kind of mental path, and I adapted what I saw online to suit my purposes, rephrasing when necessary to fit my high school clientele. While these are things that I hope my students will eventually be able to internalize, it takes modeling from me to show them how to adopt a mindset where they are at an emotionally healthy and academically ready place for learning. I’d like to share the statements that I use and a couple of ways that they pop up in real student interactions. One of the biggest indicators to me that a student is going to grow in their skills and succeed in a class is their ability to problem-solve and self-advocate. In my classroom, that often means extra one-on-one help from me. If you know any high school students, you know that asking for help isn’t always their strong suit. I get around this by introducing non-optional, one-on-one conferencing with my students often, especially early in the year. We conference on their reading, their writing, their ideas for projects… and yes, it does take up a good chunk of class time. But it’s so valuable, because it builds a routine and a comfort with approaching me one-on-one. It simply becomes part of the daily workings of class. During a conference, I will speak problem-solving thinking processes aloud that could benefit them–things like, “Hey, since you’re having trouble finding a book, let’s go through how to look up titles on the library catalog by subject or author. I bet that would be a good tool to use” or “You know, it seems like you really had trouble with your conclusion of your last essay. Should we plan ahead for that this time by talking about how to write a successful conclusion?” It doesn’t take long before they start approaching me and adopting that kind of language on their own. In turn, I try to always make myself easily available and approachable for students who need support. After nine years of teaching, I’ve cultivated some great standard responses for common questions or complaints from students. One of my favorites is set up with the cry of, “This is really hard! I don’t get it at all!” In response, I crack a huge smile and enthusiastically say, “Well, that’s a relief. If you thought it was easy and didn’t need any help figuring it out, I wouldn’t have a job! That’s why I’m here: to help you learn.” I often remind students that physical tasks, like riding a bike, take a lot of practice to learn and perfect. Why would a mental task be any different? Learning is a gradual process that doesn’t yield perfect results the first time. That’s a very freeing thing to realize. Early learning attempts should be free of pressure and judgement. Another classic comeback I have is this: “It’s ok that you’re struggling. That’s normal at first. You wouldn’t make fun of a baby for not being able to talk very well, would you? You’re still a beginner, but you will get better the more we practice.” It may seem obvious, but it can help a student snap out of the (incorrect) assumption that certain academic skills are just inherent to our personalities–instead, they arrive through exposure, study, and experience. Just like in the weight room, the more we train, the more challenge we can handle! Laziness and apathy are the enemies of discovery. It’s important to me that students learn how to challenge themselves. Too often the focus is on “What do I need to do in order to be done as quickly as possible?” I’m sure this is in some way a symptom of our hurried, hectic modern lives, but most students default to being impatient, sloppy, and rushed…especially in their writing. For students who work at a high skill level, they often get by on “good enough” without actually challenging themselves. I try to show students the value of slow consideration and revision through modeling my own writing as it takes shape. I also attempt to relentlessly push students forward in my feedback. Even an “A” paper will get revision suggestions from me in the comments–I’m sure that’s initially frustrating to my students, but I explain that one of the reasons I love writing so much is that the difficulty level is unlimited! We are always growing, and there’s always a way to revise and improve. I intentionally talk about how hard writing is. Even for someone who thinks, teaches, and does writing for a living, writing presents a challenge. “If you’re not working hard or feeling challenged, you’re not doing it right”: another axiom that I hold my kids to. The struggle should be welcomed–it’s an indication that you’re working at an appropriate level of difficulty. I want to teach all my students to savor challenge. Still figuring that one out. For kids who felt chronically helpless, giving up is the easiest way out. By the time they’ve reached the teenage years, many of them have mastered disengaging at a profound enough level to frustrate their teachers into leaving them alone to stagnate. My approach with these kids is a broken record question: “What is the first, small thing we can do to move forward?” I keep asking this. I may go away and come back. The question is always the same. I’ve come to learn that often, students are stuck on taking a step because the step feels too big. Writing an essay seems impossible. So instead, I cut it up into more digestible pieces. Depending on the student, he or she may need very small pieces. [ 1. Get out notebook. 2. Find a pen. 3. Write your name at the top of the page. 4. Write the title of the assignment. 5. Tell me about your ideas. 6. Let’s make a list of some of the ideas you just talked about. 7. Our first sentence should introduce the topic. What could you say? 8. Write that down. We can change it later….] Is it spoon-feeding? Yeah. But here’s the thing: kids eventually get sick of being spoon fed. When they rehearse the smaller steps enough times, they start to do it themselves. Small progress is still progress, and creates momentum to carry them through the task over time. Some people feel that jealousy and comparison to others are good motivators when used correctly. I am not one of those people. I believe that one of the greatest keys to happiness in one’s life is to view the successes of others as sources of admiration and potential collaboration opportunities. This is a pretty big mind shift to ask for in our culture of individualism and competition, but I really try to foster it. So many times, I’ve heard someone say of a person who does well at something “I hate her” or “I hate him.” Hate? Really? A lot of the time, this hatred comes from the jealousy of how “easily” a certain skill seems to come to an individual. But this overlooks the work behind the scenes. Success comes from diligent work, so if I call out a student as a positive example in class, I focus on the process, not the product. I hope that this teaches students that they can imitate one another’s strategies for success, rather than believing that “good” students are just somehow magically good. I call attention to writing that has gone through several drafts, a student’s copious practice sessions before a speech, a meticulous set of index cards that indicates devoted studying. I give examples of people that I admire and imitate–even if my imitation is not as good as their example, it still makes me better! We all have strengths and weaknesses, and there’s much to celebrate together.